Toss your Tamagotchi and ditch your Neopet, because KITTY!, a new app for the iPad, has poised itself as the latest answer to all of your virtual pet needs. 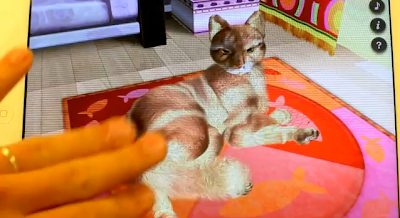 As if having real cat comandeer your tablet weren't enough, now "groundbreaking technology" will allow a virtual cat to take over your device while you enjoy stroking its realistic 3-D fur. Depending on how you play with it, the kitty will look at you, purr, and playfully swipe (what, no hissing? how realistic is that? ), and in addition to being great for children and allergy sufferers, is also guaranteed to save you a ton of money on food and litter. how could there be no comments???!! OMG I LOVE THIS!!! Sadly, I have a Droid and not an iPad. Wonder if it is available for that? @Caren I don't think so, but I'll let you know if I find anything out!